Well it's not that they released too many "new IP's" - they just released them during the holiday season where there was "new game overload" in general. Bioshock 2 and Modern Warfare 2 are going to be released about a week apart (IIRC), and obviously that's gonna impact the sales of each one. EA Exec #1(Bob): "GASP! We released a ton of new IP's last year!" Bob: "We don't DO that sort of thing! We released WAAAAY to many new IP's! We need to rely on established franchises more!" Steve: "Like we did before? When our audience kept screaming for new stuff? And you told me to get some more IP's?" Steve: "Bob... go to hell." And thus began the Dante's Inferno slogan "Go to Hell." Is that what they call games now; IPs? Modern what? I didn't quite hear what you said over the booming voice declaring "BIOSHOCK TWO!!!" It means Intellectual Property I think. Can someone remind me what this overload of IPs consisted of. There was Mirror's Edge and Dead Space, but I'm sure most people's problems with those games were not to do with a lack of fan communitites. If they really want to make some lasting demand, they should probably work more on making games with some lasting appeal. Plus, it's hard to really classify Dead Space as an IP when none of it was genuinely original. But kudos to them for making two truly exceptional games. It wasn't original? What the hell? How do you justify that? There was not a single part where I could have said with upmost certainty what was about to happen. You can't call a game non-original because it is part of a genre, fool. Yeah, but both of those games are going to have legs - they'll sell well after their release windows. And EA, this dude thinks, didn't do enough to create the possibility for that with their new games. So it's more than just when to release a game, it's sort of everything that surrounds and lead up to that, too. Calm down, fanboy. It's not like he insulted your girlfriend or anything. I called it unoriginal because it played almost identically to Resident Evil 4. The protaganist was essentially a male Samus Aran. The setting was more or less just generic spacecraft. The enemies were little more than the standard mutated human. The story twist at the end was so hilariously obvious that I was more suprised that they were even trying to present it at as a twist. I don't think there was a single part where I could have said I didn't know exactly what was going to happen; monsters would burst out of vents and try to charge at me, until eventually something happened to make the situation on the ship that much worse. I'll admit I am being a bit harsh to the game. It wasn't entirely without originality. The limb-dismemberment was fairly original and the weapons were pretty cool. Plus, the gravity-less areas were fairly new. Isaac's suit was fairly cool, too. But there wasn't nearly enough of it to make it close to original. Not that it made it bad, not by any means. I still played it all the way through and enjoyed it all the way. More of a term for potential franchise. Especially seeing how many of those "IPs" are already getting a sequel. I haven't played Dead Space so I don't know whether to agree or disagree on it's originality but an IP doesn't mean something is original. I though an Intellectual Property was just a patent/registered design/copyright of a franchise. So somebody could chirn out some unoriginal garbage and copyright that to be their own IP. I also get what they mean here. They hardly ever release any new IPs and when they finally did they grouped 'em together and maybe didn't give marketing time. *Shrug* Mirror's Edge was good though. Just check one post above. Yes, really I was just using this as an excuse to take a dig at Dead Space, because in some ways it might as well not be a new IP. I'll stop now. I don't think Mirror's Edge was undermarketed though. I seem to remember it getting more advertising than most games. It just didn't live up to most people's expectations. Fanboy? In truth, I have hated EA up to now, and probably will have some feelings of dislike until they stop it with the yearly released sports franchises. 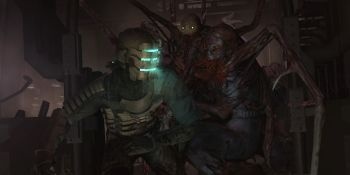 But after experiencing the awesomeness of Dead Space, I feel entitled to defend it. Aw man EA has gotta slow down, these new IP's are so overwhelming. Why can't they just stick to changing the year on every sports game they make? I think MW2 will be getting the drop on BS2, they area releasing a week early, activision likes them enough to sponsor a big ad campaign for them and 2k is still stuck with their stigma of annoying drm or direct boycotts about that. A shame, they both look like decent games. They also published Spore (funny how quick everyone's forgotten about that one). These people seem to see everything as a public relations issue. Don't any of the executives at EA see a connection between the characteristics of a product and its commercial performance? Wow I totally forgot about that (possibly on purpose). But kudos to them for making two truly exceptional games. And Spore. The story twist at the end [of Dead Space] was so hilariously obvious that I was more suprised that they were even trying to present it at as a twist. I think they were going for a Shodan moment and it failed spectacularly. An IP stands for intellectual property. And no the IPS arn't games, their just new universes and such.